On the weekend of the 12th November 2016, the Jock Environmental Monitoring Unit (JEMU) located a very young rhino calf wandering around the Jock Concession all by itself. This was a clear indication that the mother was dead. A carcass was later found, which could’ve been her mother – killed by poachers for her horns. The Regional Section Ranger, Rob Thomas, was contacted and within 30 minutes a helicopter with help was on its way. The small calf was darted and airlifted to Care for Wild Rhino Sanctuary close to the Kruger National Park. It was the great team effort by everyone that ensured that this little one has a fighting chance, as young rhino that lose their mother will only survive a night or two in the wild before succumbing to stress or being killed by lion or hyena. The rhino calf was named Jemu after the Jock Environmental Monitoring Unit who responded quickly upon finding her in the Stolznek area (near Jock Safari Lodge/Malelane area) of the Kruger National Park. Jemu arrived at Care for Wild Rhino Sanctuary on Saturday 12th of November 2016 at 15:00. She weighs an estimated 200kg at the tender age of around 6 months old. Once Jemu has bonded and learnt to trust the staff at CFW, she will be weighed to see exactly how big she is. She arrived by helicopter with Grand Knight from SANParks as her pilot, Don English as her ranger body-guard and Dr Markus Hoffmeyer as her personal veterinarian to monitor her health. Jemu had been placed on drips to maintain her condition during her first hours at CFW. Since arriving at CFW, Jemu has been doing extremely well. She took to the bottle in less than 5 hours after arrival. Soon after her first bottle, Jemu settled in well for the night. Despite waking up a few times in the night, Jemu remained calm and settled back down soon after waking up. Jemu’s early days since arriving has been mainly drinking milk and sleeping. 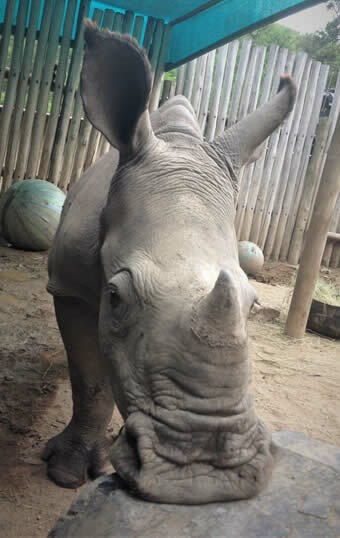 Jemu’s future is looking bright and exciting as her journey continues at Care for Wild Rhino Sanctuary. Jemu was introduced to Zac on Tuesday 15th November. On the same day we were able to weigh them; Jemu weighed in at 225kg, a mere 10kg less than Zac. On their first day together, Jemu showed Zac how to eat grass all day long and on the second day, Zac showed her how to play and have fun! A match made in heaven. Zac and Jemu had two days to bond with each other before we introduced Grey to them. Spirit was introduced to them all a few days later then on the 24th of November 2016, the four of them headed off to the big enclosures where the other bigger rhinos are kept. They all have been doing extremely well since then.